Some years ago I was one of a group of town planners taken on a trip around Aberdeen’s Bon Accord shopping centre, then under construction. Before the tour we had a briefing in the site office. 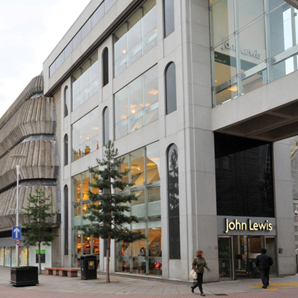 One of the many architects’ drawings on display showed the two-storey bridge that now connects the shopping centre with the John Lewis department store (shown to the right of this photo of the store). The glassed-in sides of the bridge were alive with what can only be described as a hanging garden of Babylon of shrubs and plants, trailing over the entire façade of the bridge, providing wonderful cover and colour. When we reached the nearly-completed bridge and without mentioning the drawing I asked the builders’ rep showing us round whether the bridge would be covered with greenery. God, no. You couldn’t have all that vegetation hanging over the public highway. It just wouldn’t be safe. I tell this story to illustrate the universal truth that no construction project is ever completed to look like the informal drawings of it prepared at an early stage, usually when the project is being sold to someone – client, funders or planning authority. The disconnect is greater when a design has been prepared for a competition when, inevitably, the effort and resources a designer puts into a proposal will match the chance of gaining the commission. 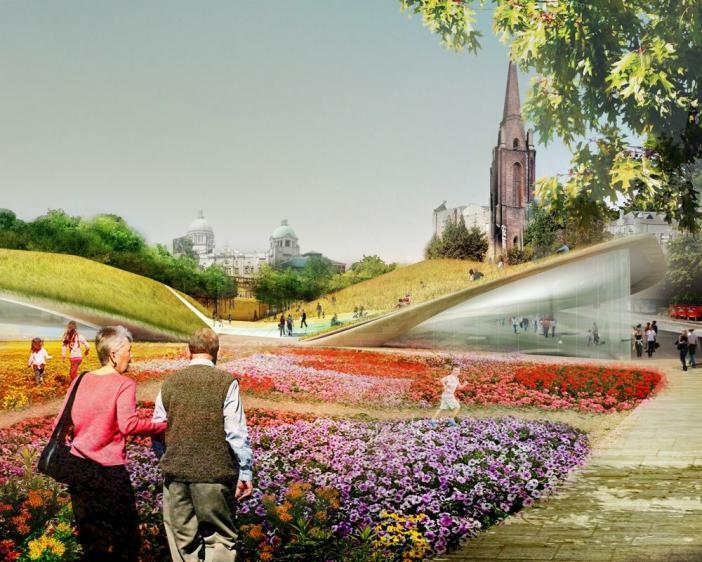 I thought it would be interesting to look at the drawings released of the proposed Union Terrace Gardens (UTG) replacement civic plaza in the light of this universal truth. Observe the triangular area of what looks like about twenty trees to the left. 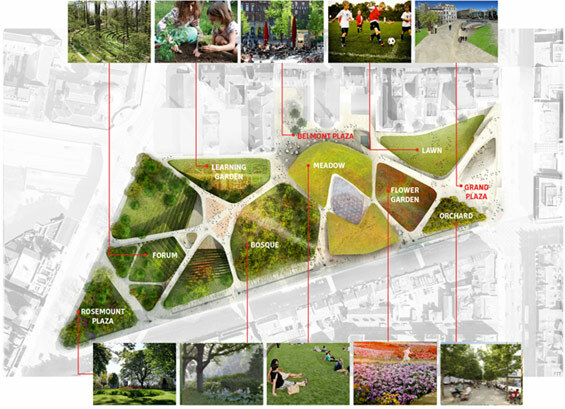 This is labelled ‘orchard’ on the overall sketch plan. What sort of fruit trees will grow successfully in a wee triangle in the middle of this northern city with the good citizens (and dogs) of Aberdeen wandering all around and between them? Note the high walkways over the site at both its southern and northern ends. Consider the graffiti, skateboarding and drop-your-litter-over-the-side potential of these walkways. Observe also the warm glow cast over the site, bathed in the intensity of a wonderful sunset somewhere to the North (ergo the image notionally at least must represent some time around the summer solstice). Note the pedestrians strolling through the foreground casting long shadows to the South notwithstanding the fact that the sun seems to be almost below the horizon behind the tall buildings on Union Terrace. Given the latitude of Aberdeen and its weather, speculate how many evenings a year the site will look anything like this. Then take a closer look at the flower garden (also seen above) and the structure behind it. Marvel at the intensity of colour achieved by the massed planting of flowers, an intensity I’ve yet to see in the city. Note the steep slope of the sustainable grassed roof of the ‘cultural centre’ behind the flower garden. See how people are strolling up this steep slope without any apparent restraint of a barrier on its edge. More could be said about all this sort of detail but I think the point has been made. With any design proposal be very careful how you read the first sketches, especially if they’ve been prepared to sell the concept. What you can’t see on these drawings (although you can on the official web site) are all the other elements of the proposal. It’s not really the purpose of this post to go beyond the points I’ve already made but I just note that there’s a 500-seat theatre tucked away underground, scarcely metres from Aberdeen’s HMT where last Saturday I saw an excellent National Theatre of Scotland production written by and starring a well-known TV star. Even with this pedigree, the theatre can scarcely have been half-full and the top two tiers of seats were closed off. Less than a mile away a private businessman is trying to restore the Tivoli theatre to theatrical use and ten minutes’ walk from the UTG site there’s the Arts Centre theatre. I’m all in favour of culture but does Aberdeen need another sizeable theatre? The pictures were nothing short of comedy – and look like they were sketched up in about 20 minutes. A forrest, in the middle of the city, with birds of prey flying through them and NO JUNKIES!!! 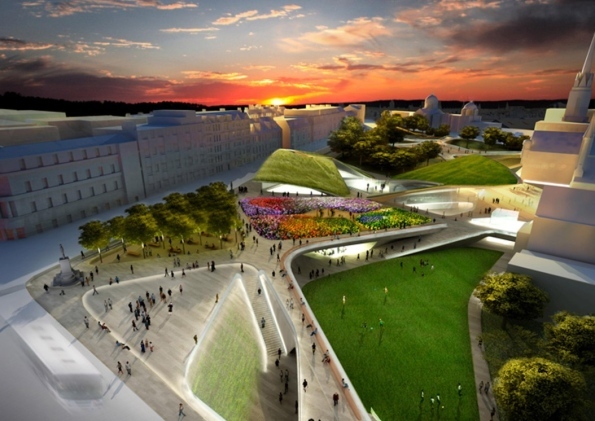 I doubt that the final product will look anything like the proposed designs (especially if they’re sticking to budget). £140M to completely gut the earth from the area, create a raised floor/roof above the train/carridgeway, lay foundations, build up, cover, then build the topping… don’t think so!